Folk singer and guitarist Richie Havens, who opened the 1969 Woodstock music festival, died Monday at age 72, his talent agency, the Roots Agency, reports. His family says Havens died of a heart attack, and that a public memorial will be announced later. Richie Havens in concert in 1973. A statement on his official website posted before Havens' death says that the singer never fully recovered from kidney surgery he underwent several years ago. His career spans decades, but he may be most famous for his role as the first performer at Woodstock. He launched the three-day festival with more than two hours of music, even running out of songs and thus improvising the song "Freedom" based on the old spiritual "Motherless Child." Steve Davidowitz, who co-wrote Havens' 1999 autobiography, "They Can't Hide Us Anymore," tells TODAY that the book title was what Havens said while looking out at the enormous Woodstock crowd. "The promoters of the event actually appeared to Richie to perform for 20 minutes or so, because no one wanted to be first," Davidowitz told TODAY. "Instead of 20 minutes, the crowd kept him on stage for more than two hours with their cheers and demands for more." After Woodstock, Havens started his own record label, Stormy Forest. He also worked as an actor, appearing in the London stage version of The Who's "Tommy" and in the 1977 Richard Pryor movie "Greased Lightning," about the first black stock-car driver to win an upper-tier NASCAR race. "Richie Havens was gifted with one of the most recognizable voices in popular music," Havens' agent said in a statement. "His fiery, poignant, soulful singing style has remained unique and ageless since his historic appearance at Woodstock in 1969. For four decades, Havens used his music to convey passionate messages of brotherhood and personal freedom." Havens was always grateful for his fans. "From Woodstock to The Isle of Wight to Glastonbury to the Fillmore Auditorium to Royal Albert Hall to Carnegie Hall, Richie played the most legendary music festivals that ever were, and most of the world’s greatest concert venues," the statement went on to say. "But even when performing in a Greenwich Village coffeehouse or a small club or regional theater, he was eternally grateful that people in any number turned up each time to hear him sing. More than anything, he feels incredibly blessed to have met so many of you along the way." Actor Lou Gossett Jr. was Havens’ co-writer on one of his most popular songs, “Handsome Johnny,” which was released in 1967 and was also part of Havens' Woodstock set. In 2001, the song was covered by reggae musician Peter Tosh, and in 2002, by The Flaming Lips. Havens also had a 1971 hit with his cover of The Beatles' "Here Comes the Sun." "Working with Richie to write his book -- a very good book, one with no curse words, no sexual exploits, but a book that shared how he self-taught himself virtually everything ... was the single most enjoyable professional experience of my life," Davidowitz told TODAY. "Besides that, he was a great friend, an amazing, fantastic performer, a truly warmhearted, giving human being. " After hearing of his death, fans began to share memories of Havens on The Roots Agency's Facebook page. "His legacy will live on forever," wrote Reese Karlan. 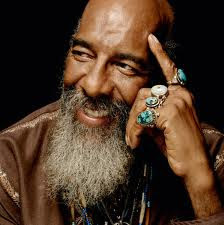 Wrote Robert Rothstein: "Richie Havens was a great ambassador of peace and humanity. His voice was unique."